Residents of a community in Imo state have been seen falling over in each other to scoop kerosene from a fallen tanker. 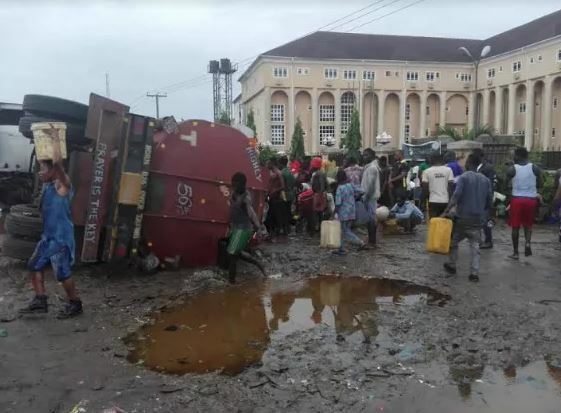 Scores of residents were seen yesterday falling on each other to scoop kerosene from a tanker that fell along Portharcourt road at the Hospital junction in Owerri, Imo state. An eyewitness who introduced himself as Kelechi, told Vanguard that the incident happened at about 03:45 pm, adding that the tanker laden with kerosene product, skidded off the road while trying to dodge a bad spot on the road. He said that a few minutes, the incident occurred residents noticed it was kerosene and they rushed to their respective houses to bring different sizes of containers to scoop the product. Kelechi, said that both shop owners, Okada riders as well as taxi drivers who were at the scene took part in the scooping exercise. “When it was about to fall many of us were shouting and very unfortunate the driver could not control his stirring very well that is how the tanker fell down. As of the time of filling this report, there was no casualty. We also called the Imo state Police Relations Officer, PPRO, Orlando Ikeokwu, who confirmed the incident and said that his men have been drafted to the scene to forestall any danger as well as to prevent the residents from coming close to the tanker.